A new search tool can be added to the family of Polarity search tools – Search.htrackyourpackages.co. These are legitimate-looking search tools developed by the company Polarity Technologies Ltd. Even though their interfaces usually suggest that they are legitimate search providers, the truth is that they are not. Since Search.htrackyourpackages.co is one of them, we cannot say that it is a tool you can keep and use for performing web searches every day. If you still perform web searches with this suspicious search provider, you might be exposed to potential threats on third-party pages. On top of that, it seems that Search.htrackyourpackages.co is capable of recording personally-identifiable information about users, so using this search tool as the one and only tool for searching the information on the web might be directly linked to the emergence of privacy-related problems. We are sure you do not want to become one of these unfortunate users, so we recommend removing Search.htrackyourpackages.co from all web browsers today without hesitation. You could set a new search tool as your default search provider easily after removing this untrustworthy one from the place of your default search engine. If you see Search.htrackyourpackages.co when you launch any of your web browsers, there is basically no doubt that a browser hijacker has managed to successfully infiltrate your computer and has already hijacked all your browsers. This dubious search tool should be set as a homepage only, but we cannot guarantee that you will not see it in the place of your default search tool as well. No matter which browsers’ settings have been changed, ignore it and go to remove it from your browsers as soon as possible. We cannot say that you can use this search tool for performing your web searches because it might return the so-called modified search results. They will be hidden among Yahoo! search results, so it will not be that easy to recognize them even for more advanced users. These modified search results will definitely not cause problems for everyone; however, those users who click on them still risk allowing untrustworthy software to enter their computers because they might be redirected to pages distributing suspicious software by clicking on any of the modified search results they are provided with. It is the main reason the removal of this suspicious search tool should be your top priority. 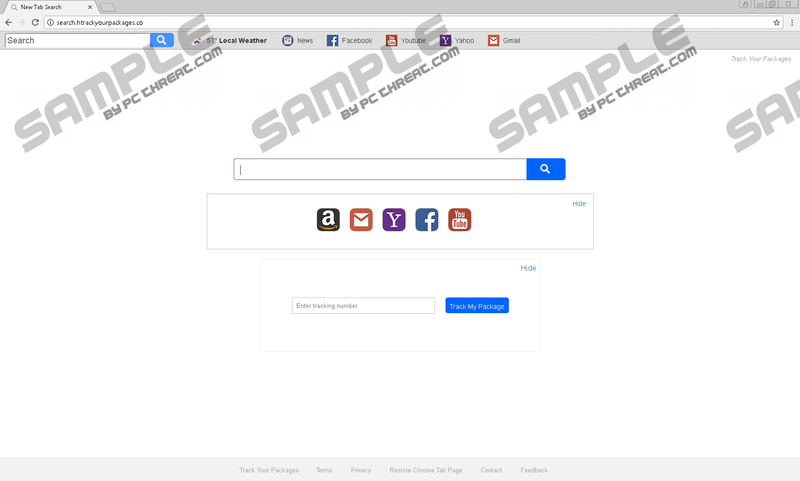 Many users wonder why a new search tool has been set without their consent, but the reason why this has happened is quite obvious – a browser hijacker has successfully entered their PCs and hijacked their web browsers. Unfortunately, we cannot say that users do not help these infections to enter their computers. They can help malware to enter their computers by, for example, installing malicious software bundles on their PCs. Of course, users do not know about that. Instead, they believe that they are installing a single application downloaded from the web. Do not let the history repeat itself – install a security tool on your computer after getting rid of Search.htrackyourpackages.co. Even though Search.htrackyourpackages.co is usually referred to as a component of a browser hijacker infection, its removal will not be very complicated since it can be removed from browsers by simply resetting them one by one to their default settings. If you have never done that before, you should let our manual removal instructions help you delete this search tool from your browsers. You can, of course, adopt the automatic removal method as well – acquire security software and then launch it to perform an in-depth scan. Open Internet Explorer and tap Alt+T. Select Internet Options and then click on the Advanced tab. Mark the Delete personal settings box. Launch Mozilla Firefox and press Alt+H. Select Troubleshooting information after accessing the Help menu. Click on the Refresh Firefox button. Click Refresh Firefox again when the pop-up window is opened for you. Open Google Chrome and click on its menu button or tap Alt+F. Select Settings and scroll to the bottom of the page. Click the Reset settings button. Quick & tested solution for Search.htrackyourpackages.co removal.